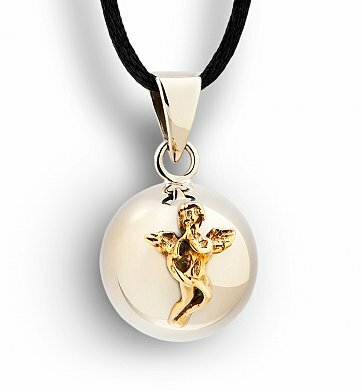 Hand-tuned for musicality and shimmering resonance, the Chiming Angel Charm is a wonderful gift to offer support and encouragement to those who may be enduring hardships, loss, or simply to remind a loved one that an Angel is always with them. One Chiming Silver Pendant Charm with Casted Brass Angel. Arrives on black satin cord. Gift arrives in presentation-ready gift box. A free card with your personal message is included with your gift. Charm Measures 20mm circumference (marble sized). Remembrance Chiming Angel Charm is a hand delivered gift. These gifts are delivered by one of our local design centers located throughout the United States and Canada. Same day delivery is available for most gifts when ordered before the cutoff time. The cutoff time for Remembrance Chiming Angel Charm is in the recipient's time zone. The recipient lost her husband recently and was truly touched by the gift. She said she will wear it, always, to remember her lost love. I was very pleased to hear the receipient of this gift say, "when the Angel Jingles, she reminds me that Bill loves me." At least 18 times in the first few days, my friend has said, "This is the best gift, ever." It gives a quiet, affirmation of the wearer's self worth and that she is truly loved. It reminds her with a quiet "jingle" at the very moment she starts to feel lonely or depressed. The Angle's chimes are good "heart therapy." My nephew had died and my sister was broken hearted, so I ordered this to try to help her pain. When she received the package it was opened, contents missing. No idea why usps would deliver an empty package, even stating it was open and contents missing. I called GiftTree and they sent a replacement the next morning via UPS. Very understanding and compassionate customer service, I will use GiftTree again and recommend to everyone I know. I just thought that it was flat. Other than that it is beautiful. I'm very pleased. I bought this for a friend who just lost her husband and I wanted to send something that let her know I was thinking of her. She absolutely loved it! I was concerned about what it looked like and she told me it was beautiful! I was looking for a gift for my sister in the loss of her son and she totally loves it! Such a lovely sentimental keepsake. Sent this to my daughter when she was having a rough time and she absolutely loved it!! Even the leather chain was made well she said and she loves how the Angel chimes when she moves!. I love this, I ordered one for myself also and am going to order one for my sister as a Christmas gift. This was a gift for someone and they absolutely love it! I sent this chiming angel charm to a friend as a healing get well gift and she loves it! The chime is very soft and lovely. this was a gift for a friend and she loved it. Sent to my adult niece as a reminder that she is always loved and watched over, and she loves it! The delivery was so quick too! Which is what I love about Gift Tree and I use them whenever I need a thoughtful and quick gift for someone far away. I gave the Chiming Angel Charm to my sister to remember our father and my best friend to remember her husband who has just passed away recently. They both loved the gift. Thank you gift tree for providing a large assortment of thoughtful gifts. I bought the chiming angel, for sister other friends and family when my sister was diagnosed with Breast Cancer. The charm is sweet and has a very delicate tinkle. I love it and so did everyone else! The recipient of this gift was very pleased. She was quite impressed with the box and she put the charm on immediately. She found the chiming lovely. Thank you for the perfect gift. I originally purchased this charm for myself but loved it so much I also ordered one for my mother & two daughters. Now my mother is ordering one for her 91 year old sister. I think that says it all. One curiosity is that my mother's is gold rather than silver & since the description says they are "hand made German silver" pieces, I need to find out more about this. Also, our angels are standing with what appears to be an instrument rather than perched on their elbows, so the design is different than what is displayed online.